Jucifer has spent all year, every year on the road since moving into their tour vehicle 11 years ago. Years based in Athens, Georgia from 1991 until 2001 were pivotal both for Jucifer and the Southern scene itself, which has evolved to strongly reflect bands such as Jucifer and their contemporaries (Harvey Milk, Eyehategod, Cavity, Floor, Crowbar) embracing their style of artistic exploration anchored in brutal heaviness. In 1994 Jucifer saw its first release, four track demos on hand dubbed cassettes. During this time they also recorded at a friend's home studio, Rock Central. Two songs from the Rock Central session were released on a 1995 7" ('Superman' b/w 'Licorice'). and on cassette when in stock. 'Nadir' is currently being issued for a special tour-only cassette version by British label Future Noise to coincide with Jucifer's April UK dates. The EP will also be issued in a vinyl format later this year by newly formed record label arm of Canada's Handshake Inc film company ('Maryland Deathfest The Movie','Disgorge Mexico' etc). '94 and '95 also saw Jucifer begin to build their audience, landing opening spots with legends like the Melvins (who they would go on to support many more times) Mark Arm, and Lubricated Goat. Jucifer's second foray into the studio produced the iconoclastic Calling All Cars On The Vegas Strip. The album was released on local Athens indie label Crack Rock Records in 1998, two years after its recording was completed. In the interim Jucifer toured regionally and also joined Meltbanana, Keelhaul, and Man Or Astroman during their US tours. When it was finally released Calling All Cars charted on college radio with little promotion, and was widely acclaimed by critics as groundbreaking. Attention from this drew scouts from various major labels--- most notably Capricorn Records, then home of 311, as they would sign Jucifer in 1999. Capricorn re-issued Calling All Cars On The Vegas Strip in 2000. The label then released Lambs (2001), I Name You Destroyer (2002) and War Bird (2004). Following the re-issue of Calling All Cars, Jucifer began to tour full time. During this period they did US tours with High On Fire, Unsane side project Cutthroats 9, and the Melvins, and were themselves supported by such future luminaries as Mastodon, Big Business, Lightning Bolt and Skeletonwitch. In 2006, following the demise of Capricorn, Jucifer signed to iconic metal label Relapse. Relapse immediately issued If Thine Enemy Hunger, a leftover from the band's Capricorn deal. In 2008 Relapse released Jucifer's acclaimed double album L'Autrichienne. 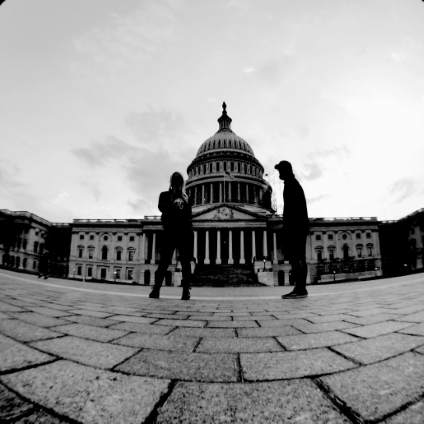 In 2010 Jucifer formed their own label Nomadic Fortress and inked a distribution deal with Relapse. Jucifer's latest album Throned In Blood was released April 6, 2010. This was followed by the recent re-issue of their 1994 four track EP 'Nadir'. Jucifer is currently in production for a new album (expect in late 2012) and will also be releasing some splits and side projects in the near future. 2012 tour has been in full swing since January with dates around the eastern half of the US. The band hits the UK and Europe during April and May, including appearances at the legendary Roadburn and SWR Barroselas festivals, before returning to Russia for an extensive three week stint in June. Album Review: Jucifer - "District Of Dystopia"